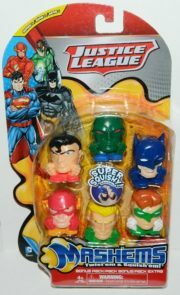 This is series 1 of DC Comics Justice League Mashems line of super squishy and twisty soft toys. They are made in the image of popular characters from the world of DC Comics. 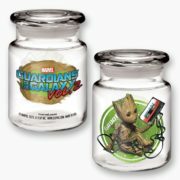 This is a clear apothecary style 6 oz jar featuring the comic art image of the Baby Groot of Marvel Comics Guardians of the Galaxy with a cassette tape on the front and their name logo from the second movie on the back. It measures 3.75″ high and comes with an airtight lid, perfect for storing those small items you want to keep fresh. This is the image of Magneto as a Kooky Pen collectible. It is number 14 in the series and comes from the third series release. These are limited hand painted wooden pens with a Kooky top and keychain attachment with the figure base measuring 3.5″ high. 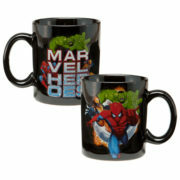 This is a 10 ounce glass set featuring art images of Captain America, Wolverine, The Incredible Hulk and Spiderman. Produced in 2014 this is a 20 ounce white ceramic coffee mug that features comic art images of Marvel Comics characters Wolverine, Spider-man, Iron Man and Captain America. This is black bi-fold vinyl passport holder or coat wallet and a luggage tag featuring the faces of Marvel Comics heroes the Amazing Spider-Man, the Incredible Hulk, Wolverine and Captain America in panels on each side. The passport holder measures 3 7/8″ x 5 3/4″ folded and has a clear pocket for the passport on one side and 3 open pockets on the other and the luggage tag measures 3 7/8″ x 2 3/4″. 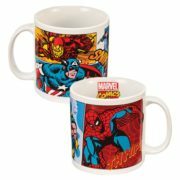 This is a black, ceramic 12 ounce coffee mug featuring Marvel Comics heroes The Amazing Spider-Man, The Incredible Hulk and Wolverine in a wrap-a-round design. Produced by Ata-Boy this is a licensed car magnet measuring 4″ x 4″ that features the die-cut image of the red X logo of Marvel Comics The X-Men. This is a new, never used, magnet in a sealed display packet. 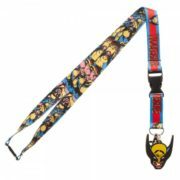 This is an 18″ long multi-colored, cloth and plastic lanyard with comic art images of Wolverine from Marvel Comics along with his name. There is also a 1.75″ x 2.25″ rubber Wolverine head logo charm on the end of the lanyard. 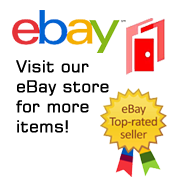 Included is a collectible sticker in the image of his face above his name. It can be used to hold keys, name tags, and more. This is a regulation deck of poker size playing cards which features 52 unique images from the Wolverine’s comic history. It is a new, unused, original shrink-wrap set in mint condition. This item has been stored in a smoke and pet free environment. 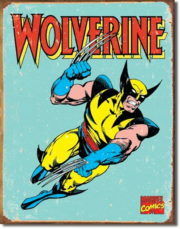 This is a 12 1/2″ x 16″ heavy grade tin sign that reproduces retro comic art of the Marvel Comics classic Wolverine. These are produced in the style of the original tin signs that were common in the first half of the 20th century. This sign is intentionally made with defects, including rust on the edges, in order to give it the appearance of an authentic aged sign. It is a mint (as produced with intentional flaws), never used sign, complete with pin holes in the corners for easy hanging. These also look very nice framed. 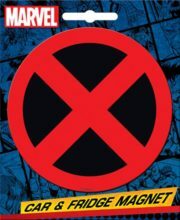 This is a licensed 2.5″ x 3.5″ magnet featuring the comic art reproduced image of Marvel Comics X-Men #1 comic book cover. It has been stored in a smoke and pet free environment. 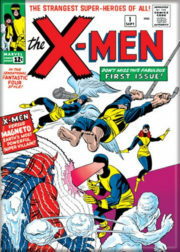 This is a licensed 2.5″ x 3.5″ magnet featuring the comic art reproduced image of Marvel Comics X-Men #135 comic book cover. It has been stored in a smoke and pet free environment. 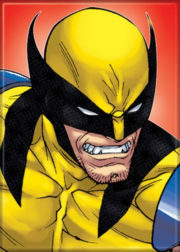 This is a licensed 2.5″ x 3.5″ magnet featuring a comic art reproduction of Marvel Comics X-Men character Wolverine with an angry look. It is new and unused. 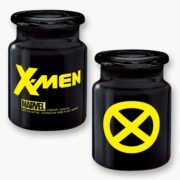 This is a black apothecary style 6 oz jar featuring the comic art image of the X logo of Marvel Comics X-Men on the front and their name logo on the back. It measures 3.75″ high and comes with an airtight lid, perfect for storing those small items you want to keep fresh. 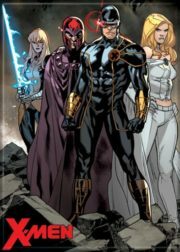 This is a licensed 2.5″ x 3.5″ magnet featuring comic art reproduced of Marvel Comics X-Men characters Magik, Magneto, Cyclops and Emma. 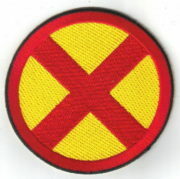 This mint, unused 3″ wide embroidered patch features the shoulder logo seen on the uniforms of the X-Men in the recent movies. Produced for the comic book marketplace, this is a difficult patch to find outside of comic book conventions and stores. 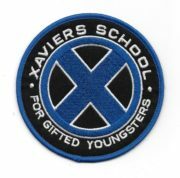 This mint, unused 3.5″ wide embroidered patch features the logo of Xaviers School For Gifted Youngsters, blue version, as seen in the recent X-Men movies. Produced for the comic book marketplace, this is a difficult patch to find outside of comic book conventions and stores. 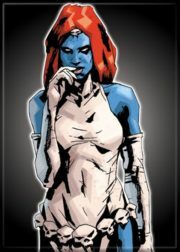 This is a licensed 2.5″ x 3.5″ magnet featuring the comic art image of Marvel Comics X-Men character Mystique standing. This mint, unused 3.5″ wide embroidered patch features the name logo of the Marvel Comics super-hero team the X-Men. Produced for the comic book marketplace, this is a difficult patch to find outside of comic book conventions and stores. It comes with a glue backing for easy application to cloth surfaces and is stored in a smoke and pet free environment. 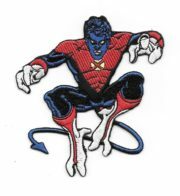 This mint, unused 4.5″ high embroidered patch features the running image of Marvel Comics X-Men member, Nightcrawler, as seen in his original comic book appearances. Produced for the comic book marketplace, this is a difficult patch to find outside of comic book conventions and stores. 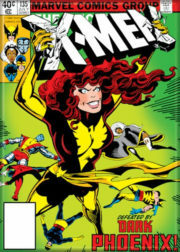 This is a licensed 2.5″ x 3.5″ magnet featuring the comic art image of Phoenix with the Flaming Phoenix behind her back as seen in X-Men from Marvel Comics. 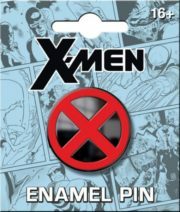 This mint, unused 1″ wide thick licensed enamel pin features the familiar image of the red and black logo insignia of the X-Men as seen in Marvel comics. Produced by Ata-Boy in 2018 this has not been a widely distributed pin, found usually at sci-fi and comic conventions.